Clip and turn in any Box Tops on the consumer goods that you buy everyday. Turn the box tops into your child's teacher to count towards the monthly class popcorn party prize. Each box top is worth 10 cents for our school. Learn more about the participating products. Here is the Box Tops collection sheet if your student enjoys using those (Glue or tape the Box Tops to the sheets- no staples please). Otherwise, they can be sent to class in baggies. Make sure to include your child's name and teacher so they get credit for our turn-in contest! Don't forget to check the EXP dates, they must be valid! Box Tops has also released an App called "Box Tops for Education Bonus App". In addition to turning in traditional Box Tops, this app gives you an easy way to earn Bonus e-Box Tops by scanning receipts for qualifying purchases. Go to BTFE.com and create your own account. You can keep track of our school’s earnings, print out money saving coupons for General Mills products, and enter contests to earn online Box Tops Bonuses for our school. 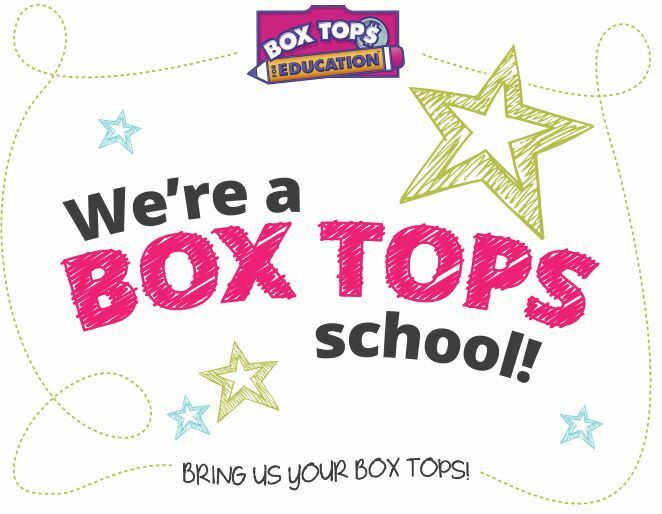 You can also redeem e-Box Tops codes that you receive at the grocery store checkout or during retailer special promotions (Sam’s Club, Costco and Walmart usually have these in the fall). Subscribe to Box Tops for Education Facebook page where you can find out more ways to earn Box Tops, watch informational videos and learn about in-store promotions. Keep an eye out for Bonus Box Tops Certificates. These are like Box Top boosters that are worth more money than regular Box Tops. You can find them: In stores during special promotions, on specially-marked packages and at checkout, printed on the bottom of your sales receipt. Please turn these in with the regular Box Tops coupons. Send a letter to family and friends asking them to collect and send Box Tops to your student. Think about sending these to grandparents, uncles and aunts, older neighbors, and friends who do not have children. In-state or out-of-state. Consider sending a self-addressed, stamped envelope for their convenience. There is a sample letter in the links below for your reference. Designate a Box Tops collection spot in your kitchen. A simple idea is to hang a plastic snack bag on the side of your fridge. Refer to the “Clipping 101” sheet before submitting Box Tops. See below. Please do not turn in expired Box Tops as they have no value and will be thrown out. Print out collection sheets if your student enjoys using them. Sheets have spaces to attach 10, 25 or 50 Box Tops. Use glue or tape. Please no staples and do not attach more Box Tops than there are spaces on the collection sheet. There are several links below for your reference.